This pent roof shed makes the most of a classic design as it allows you to gain a very accommodating storage space in your garden without it looking bulky or obtrusive as some people find apex roofed sheds to be. We really liked the look of this shed and it has a dark golden glow thanks to the pre-delivery preservative treatment. This gives it good initial protection from the weather, although it’s important that the owner carries out extra treatments on a yearly basis. The pitch of the roof is enough to carry rain and snow away, so you won’t have to worry about it sitting on the surface and causing rot to occur. This rainproofing is further helped by the well constructed tongue and groove cladding through which water cannot penetrate, as well as by the tough mineral felt which is applied to the solid sheet roofing. Thanks to the combination of these features, the manufacturer has been able to give a 10 year warranty against rot. You need a wide door to make the most of a wide fronted shed, and thankfully that’s exactly what Windsor have provided. Although it could be a little higher, you’ll have no difficulty in getting wider objects in and out which is one reason why we can also imagine this shed being used as a workshop or a bike store. This pent roofed storage shed has flexibility at its heart. Because of its wide single door it can be used as a bicycle store or a place to keep a mobility vehicle or ride on lawn mower, and because of its front facing window it could even be used as a small scale workshop. We liked the look of this garden building, and if you have a traditional country garden then this should fit right in. 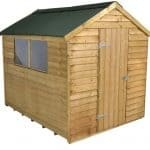 Pent roofs give a truer indication at first sight of a shed’s overall storage capacity, although the pitch on this shed was more pronounced than on many sheds we review. This has a ridge height of 1.97m and an eaves height of 1.70m. The overall depth of the shed, including overhang, is 2.39m, and the width including overhang is 3.14m. 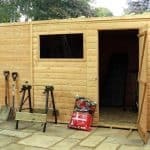 The cladding and frame are the most important aspects of a shed, especially if it’s going to be sited in an area that’s exposed to the elements. 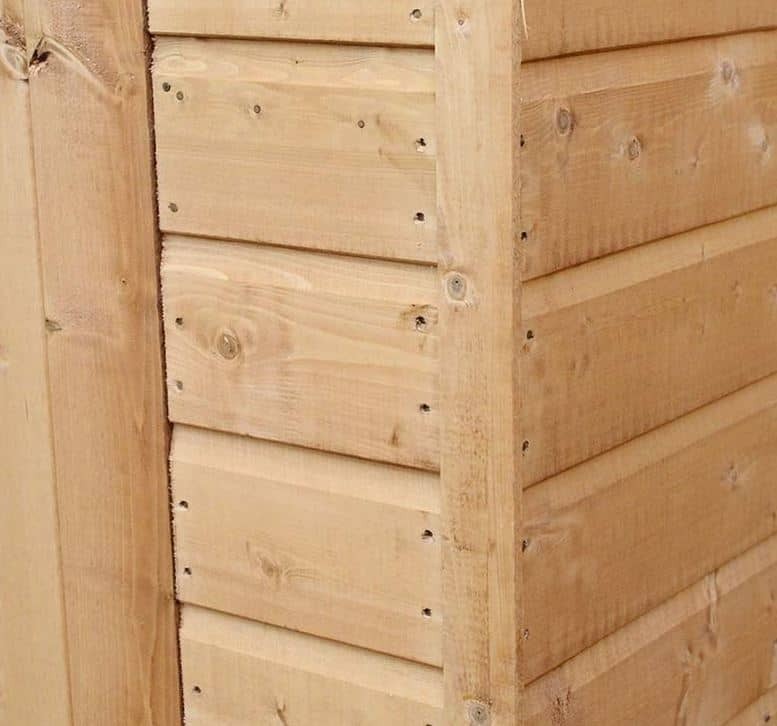 The frame itself was solid if a little thinner than some we see at a rounded 29mm, and the same could be said for the shiplap wall cladding which is made of 12mm thick softwood. As a whole it feels stable, but we would have preferred it have been a little thicker. If the walls could have been slightly thicker, we would have preferred the floor to be a lot thicker. They are made of solid sheet material rather than tongue and groove timber, and so you may want to reinforce the floor at the time of installation. One feature we did like, however, was the pressure treated floor joists. These have excellent protection against rot, and by elevating the floor itself they give it added protection against moisture rising from the ground. We were pleased to find that the cladding had been dip treated in preservative, as this gives it a good initial protection against moisture and therefore rot. The shiplap cladding also keeps water out due to its interlocking design. The manufacturer’s have shown how confident they are in the effectiveness of these defences by providing a 10 year warranty against the appearance of rot, which is good to know. 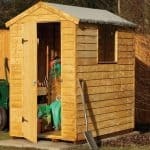 As with many other wooden sheds, this will require re-treatment on an annual basis with a good quality wood preserver. Failure to do so can invalidate your warranty, and lead to rot appearing. We liked the fact that a tub of treatment is included when you buy the shed, as this helps to keep costs down in the first year. We sometimes find large sheds that have narrow doorways, but thankfully that wasn’t the case here. It’s width of 0.72 may not be the widest single door we ever see when reviewing sheds but it is still more generous than many. We would, however, have preferred a door height that was taller than 1.66m. The door is braced and features a pad bolt, although these factors in themselves aren’t enough to make it secure. The window is one of the features we liked the most. Front facing, it allows you to see out across your garden and allows just enough light in without exposing the contents of the shed too much to passers by. It’s glazed with styrene, which is tougher than standard glass so you won’t have to worry about the dangers of it shattering on accidental impact from a stone or chipping. As mentioned above, we would have liked to see more consideration given to the security of the shed in the form of a padlock, or even a shed alarm. On the positive side, the padbolt is holed and ready for a padlock, so we’d highly recommend purchasing and fitting one. 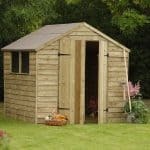 This shed is so good looking that you might want to keep it in its natural state, but it’s important to realise that left as it is, it won’t take long for the sun to bleach it to a silvery grey colour. That’s why we’d recommend buying and applying a wood stain, and there are four shades available to purchase at the same time as the shed: dark brown, light brown, red cedar, and ivy green. Another optional extra is an assembly tool kit. It contains all the basic tools you’ll need to erect your shed, namely a saw, hammer, and two screwdrivers. 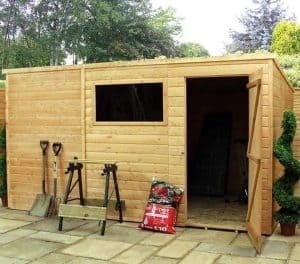 If just the idea of assembling your shed makes you reticent about buying one, there is also the option of a garden building installation service allowing you to sit back and let the professionals do it for you. Whilst we would have liked to see tongue and groove used throughout, and not only on the wall cladding, this is still a well constructed and good looking shed. Thicker materials all round would have improved its durability, but even so we wouldn’t be surprised to see it outlast its 10 year warranty period. The relative lack of vertical space has an adverse effect on the storage volume as a whole, but there is still plenty of floor space available for a small to medium sized garden. There are quite a lot of components and many of them look similar, so pay close attention to the instructions. 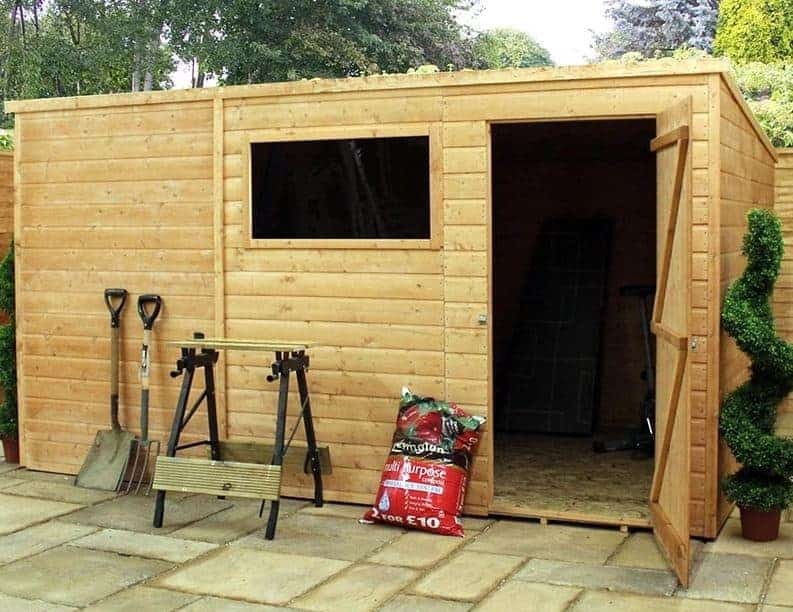 By doing this, you and a friend should be able to assemble this shed in around four to six hours. 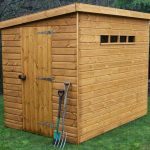 For its size and durability we feel that this is a good value shed, and this is enhanced further by the inclusion of a free tub of wood preserver. 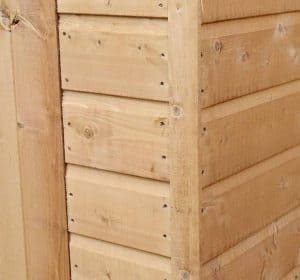 Final Thoughts: If you’re a fan of the unique and yet traditional look that pent sheds have, and we certainly are, then you should give this shed serious consideration. 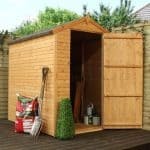 Its size makes it an ideal building for a small to medium garden, and the inclusion of a window means that it’s a shed that you’ll be happy to spend time in, even though you may have to bend down a little when getting in and out. You will have to treat it on an annual basis, but the first year’s treatment is on the manufacturer thanks to the free tub of treatment. It’s a neat touch that epitomises the attention to detail that Windsor have provided.